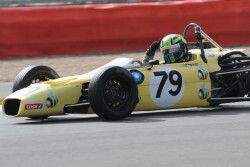 Callum MacLeod steered the Speedsport Merlyn Mk20A to two lights to flag victories at the prestigious Silverstone Classic meeting at the end of July. After a narrow victory on the Brand Hatch Grand Prix Circuit two weeks earlier, Callum and the team were determined to impress at Silverstone, and they certainly did that ! Pole position by the astounding margin of two seconds was followed by dominant wins in both races when Callum judged the rolling starts to perfection and immediately opened up an impressive gap. His winning margins of over 6 seconds, were complemented by fastest laps in both race. Thanks go to Abacus Insurance Services, Tesa UK, Scholar Engines and the hard working team of mechanics at Speedsport. Josh West returns to drive the Merlyn at the final two races of the season at Brands Hatch and Silverstone, where he may be joined by a newcomer in another Merlyn currently being built up.